June last week was bit busy for me, we celebrated few birthdays and today am posting the cake i baked for my daughter's birthday, since she dont like fondant and buttercream frosting i dont want to make a large cake covered either by fondant or a simple chocolate frosted by buttercream. I want something special as this year she reached a milestone of her life. I was searching something different from the usual simple cake and finally i opted for this Hidden heart mocha cake. 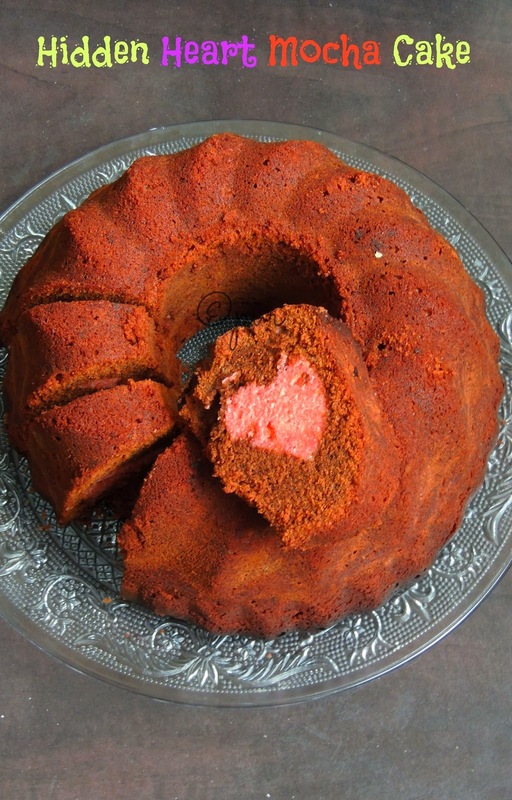 Actually when i went for googling for this cake, this cake takes the first place among the cakes baked as Valentine's day special, but for me anyday is valentine's day and my kids are more than anything, thus i went for making this amazing hidden heart cake for my daughter's birthday. Initially i planned a simple vanilla cake with chocolate hearts but my daughter is very girly and she loves pink colour very much, obviously i went for a pink strawberry cake for making those hidden hearts along with a simple mocha cake. This rose hidden heart mocha cake came out simply prefect. I did a small mistake but however those hearts looks fabulous, actually i have to name this cake as inverted hidden heart cake, coz while arranging the cake i didnt noticed that am using a bundt cake pan, actually if you are using the bundt pan you need to keep the hearts invert so that when you turn the cake you can see the hearts in correct position.I didnt noticed it while arranging, but never mind everyone at home loved this suprising hidden heart cake. If you are using usual loaf pan, you can arrange the heart straight away, however we learn always by making mistakes rite. Check out this beautiful cake and surprise your family for special occasions. Eventhough this cake may sounds very simple for the occasion, my daughter enjoyed thoroughly. The mocha cake and the pink strawberry hidden hearts tastes fabulous together.This cake goes for eggs and its butterfree. Sift the flours with baking powder,food colour and keep aside. Preheat the oven to 350F..Beat the eggs with sugar until they turns soft and fluffy, add the yogurt, oil,strawberry crush and beat well. Add the dry ingredients to the wet ingredients,dont over mix and mix gently with a wooden spatula until everything get well mixed. Pour the cake batter in a greased loaf mould lined with a baking sheet, i used silicon cake mould for making out this cake..
Bake the cake in the middle rack of the oven for 20-25 minutes, until a skewer inserted come out clean. Remove the cake and let it cook completely in a wire rack. Slice the cake as medium sized thick slices, with a heart shaped cookie cutter, cut the cake as heart. Remove the heart carefully, arrange over a wire rack and keep aside. Meanwhile sieve the all purpose flour, sugar,baking powder and keep aside. Add the buttermilk, oil to the egg-sugar mixture, beat well. 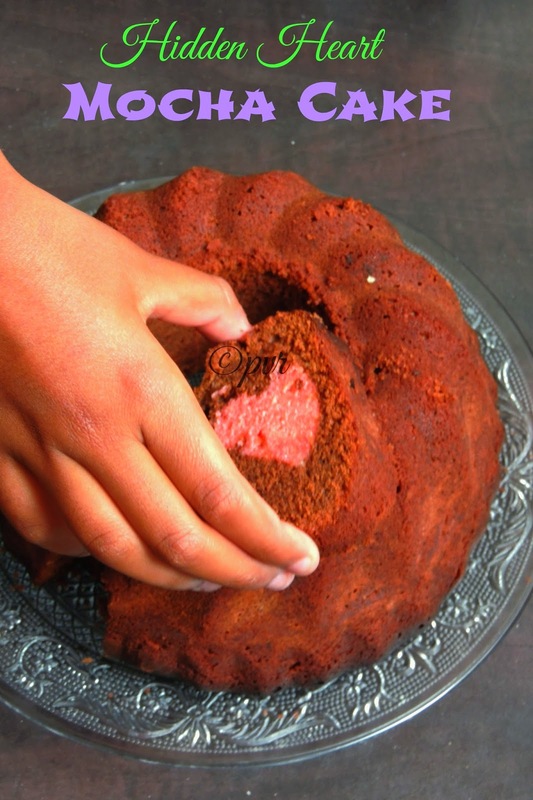 Grease a bundt cake mould generously. Pour slowly the remaining batter over the hearts and let them cover completely with the batter. Bake in middle rack for 30-35minutes or until a skewer comes out clean. Let the cake cool completely in wire rack. Dont make the mistake as i did, if you are using bundt pan, dont forget to invert the hearts while arranging in the bundt cake pan. If you are using loaf pan, keep the heart straight.No need to invert them. Keep the hearts one by one, close to each other, in the picture there are small gap in between, i did as though just to show how to keep them. Later i kept the remaining hearts inbetween before pouring the remaining cake batter. This cake goes for two cakes, you can bake the cake you are using for hearts a day before and conserve them properly when dont have enough time to bake both cakes one after another. 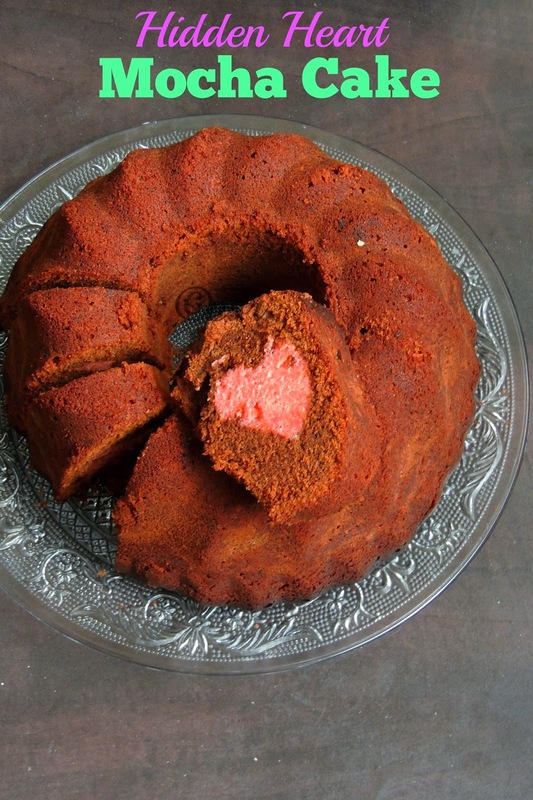 The next day you can prepare the next cake batter and bake this hidden heart cake. Beautiful hidden heart cake aks :) looks so inviting too. I can see you have used your bundt pan ;) love it. love the idea of a hidden heart!! very beautifully done!! superrr hidden heart cake.. beautifully baked it!! That's such a lovely and cute cake for your daughter's b'day.. love those hidden hearts..
Cake looks tempting dear....... That cute heart is pretty !!! Such a cute cake Priya and many many wishes to your little big one! Cake looks so so lovely Priya..
What u are having Valentines day now in Paris :)just kidding. What a lovely way to celebrate ur daughters's 12 th results.Beautiful cake inverted or not.Anything made with love is always the best. The cake looks lovely and my belated birthday wishes to your daughter.